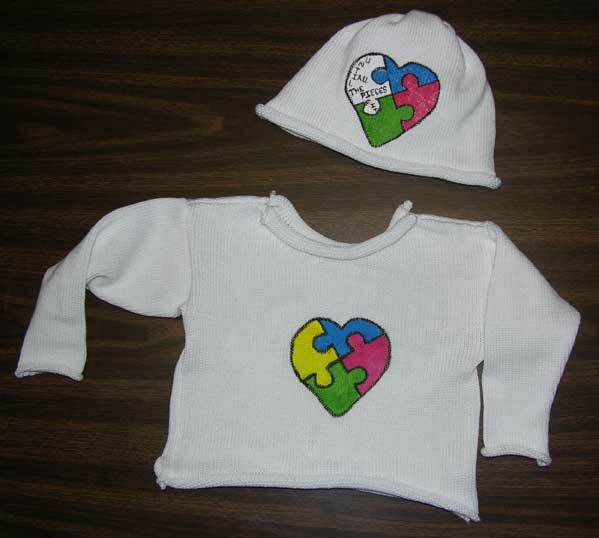 This hand painted pullover and cap set features an Autism heart puzzle. The sweater and cap are knit from our soft cotton yarn and has rolled edges at neck, sleeves and bottom hem. This one of a kind sweater and cap is in a white color. The sweater has the heart with 'all the pieces fitting together, and the cap has the white puzzle piece that represents 'Every Piece is Unique'. See 'About the Autism Puzzle" below. Set: Autism Heart Puzzle "Until all the pieces Fit"
As Danielle has time to paint the sweaters, we will offer them on the web site. She is also painting some wearable art adult cotton sweaters. Danielle will take special orders, but remember each painting is one of a kind. The heart with the missing white puzzle piece and the scrambled words “Every Piece is Unique” represents the differences in how the autistic child / person processes the world around them. Some are non verbal and have the frustrations of communicating. Some have sensory issues which may include feeding problems. Some are just seen as eccentric. Each is unique in their own way.